A wonderful way to use leftover cauli-mash. This cauli “bread” sticks are not only low in carbs but are gluten-free, wheat-free and grain-free. Combine the cheese and cauli-mash. Season according to taste. Mix till a soft semi-stiff batter form. Line a baking sheet with baking paper. Lightly grease. Pour half of the batter onto the baking paper and spread thinly. Cover in half of the mixed cheese. Sprinkle with dried parsley and some garlic salt. Bake at 250C till the base is brown and the cheese melted and browned. As the cheese cools, the base becomes firmer. Serve with a relish of choice. Thanks dear, love it can use it in so many different ways. 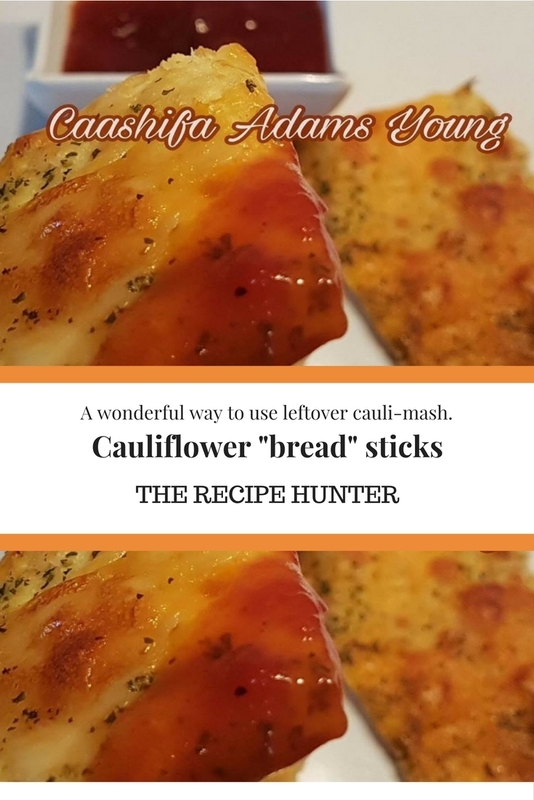 Love it but can you explain how to make cauliflower mash ? What a great idea. Cauliflower is so “tasteless” that I sneak it into all kinds of foods for the grandson who is anti-vegetable. This is a new one, Esme. Thanks! Yup, one need to use sneaky ways from time to time with the kiddos.